Chemical Peels have been used for over 100 years to create an even and controlled shedding of damaged skin cells. Each year thousands of chemical peels are performed in the United States. A chemical peel uses a solution applied to the skin to remove dead skin cells and stimulate the production of new skin cells. It tightens the skin, reduces wrinkling and restores a more youthful appearance. 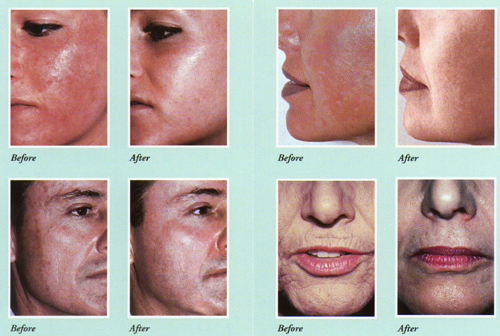 Chemical peels are most commonly performed for cosmetic reasons -- to enhance your appearance and your self confidence. Chemical peels may also remove pre-cancerous skin growths, soften acne facial scars and even control acne. In certain cases, health insurance may cover the peel procedure. Be sure to check your policy and contact your insurance company before the procedure is performed. During your consultation with Dr. Sexton you will want to explain the level of skin improvement you hope to achieve. Dr, Sexton will then review your medical history and examine your skin type and pigmentation to determine if you are a good candidate for a chemical peel. Together you can evaluate the advantages and disadvantages of the different types of chemical peels, discuss your options, your expectations and determine the best treatment for you. Reactions to chemical peels are similar to a sunburn and range from mild to more pronounced. Generally, the deeper the peel, the longer the recovery. A light peel usually results in some redness, and possibly some scaling for a few days. Medium and deep peels can result in swelling and blisters that break open forming a crust and turning brown, followed by peeling which can last up to two weeks. These peels may require dressings on some or all of the treated skin. Dressings are usually removed after a day or two. Ointments and creams will be applied to keep the skin moist. At first the new skin will have the color of a significant sunburn. This will gradually fade to pink over the next several weeks. Cosmetics can be applied after about two weeks. Following a chemical peel, your new skin will be tighter, smoother and may be slightly lighter than it was before surgery. Alphahydroxy acids (AHAs), such as glycolic, lactic, or fruit acids are the mildest of the peel formulas and produce light peels. These types of peels can provide smoother, brighter-looking skin for people who can't spare the time to recover from a TCA peel. A glycolic acid peel may be used to treat fine wrinkling, areas of dryness, uneven pigmentation and acne. Various concentrations of an glycolic acid may be applied weekly or at longer intervals to obtain the best result. Dr. Sexton will make this decision during your consultation and as the treatment proceeds. An alphahydroxy acid, such as glycolic acid, can also be mixed with a facial wash or cream in lesser concentrations as part of a daily skin-care regimen to improve the skin's texture. Glycolic acid peels result in a dramatic improvement in the skin's clarity, texture, color and tone. Lines and wrinkles are diminished resulting in firmer, smoother skin. Pores appear smaller and are clear of impurities, improving acne-prone oily skin. Patients say their skin feels "refreshed." Trichloroacetic acid (TCA) is typically used as an intermediate-to-deep peeling agent in concentrations of 10 to 35%. This type of peel is useful for patients with surface wrinkles, superficial blemishes, and pigmentation problems. TCA may be used on the neck as well as other areas of the body such as the hands, forearms, and chest. The treatment is rapid, requiring only thirty minutes from beginning to end. Once the treatment is completed, you can expect to shed the dead, outer layer of skin for approximately three days. Following this, you can expect your skin to be completely healed within ten to fourteen days. At that time you will notice improvement in the appearance of your skin, which will have less wrinkles, blemishes, and pigmentation problems. You will also notice a healthy glow as your face appears radiant and shining. TCA is a deeper peel than most of the superficial peels discussed in this section. Because it is a deeper treatment, your "downtime" will be approximately one week. During this time of peeling and healing, you will be required to keep your facial skin moist with A&D Ointment or Vaseline at all times. After you are healed, sunscreen use is very important because you are initially much more sensitive to the harmful ultraviolet radiation from the sun.